It is always so wonderful to find easy fast dinner recipes that are really tasty and nutritious too. We all live such busy lives these days and don’t have the luxury of spending hours in the kitchen creating gourmet meals. We want delicious healthy food that can be prepared in no time at all. Dinner time is a very important and special time of the day. I think it is especially important for the whole family to sit around the dinner table together and talk about the day - because quite often the family hasn’t seen each other since after breakfast. This time is especially important for children to feel re-connected with their parents and possibly voice certain concerns and get advice about things that are happening in their lives. Studies have shown that children who have a regular family mealtime are much less likely to smoke, drink, use illegal drugs and get into fights. They are more likely to do well at school, have healthier eating habits and have less suicidal thoughts. This is because children who experience a strong family bond - which regular family mealtimes helps build – are emotionally content. I found it absolutely amazing to learn that regular family mealtimes is the single strongest predictor of good behaviour and good academic achievement – regardless of family size, income, race, gender and education. A great way to get the family talking is to let each family member have a chance to talk about his/her day and to remember past family holidays or other memorable occasions. Children always love to hear family stories about when they were younger or when the parents were younger. I challenge you to embrace the chance of spending quality family time together around the dinner table – or any other meal of the day – and see what an amazing difference it makes in your life and in the life of your children. I have collected and created quite a few quick recipes for supper that really work for me and I am delighted to share them with you! Here is a list of my favourite healthy, easy fast dinner recipes that I’m sure you will love too. Baked Salmon Fillet or Steaks - An absolutely out of this world, delicious and healthy recipe that is so quick and easy to make. Chicken Salad - this salad is packed with superfoods and incredibly delicious, quick and easy to prepare. Chicken Stir Fry - Looking for easy supper recipes that are delicious, low in saturated fat and loaded with goodness - check out this quick chicken stir fry recipe. How to Grill Salmon - Find the best grilled salmon recipes that are quick and incorporate healthy Omega 3s into your family's diet. This is a great summer dinner recipes option! Lentil Stew - loaded with beta-carotene and folic acid…my whole family loves this very tasty meal and as an added bonus being meatless, it makes our cheap dinner recipes list! Salmon Patties - Delicious easy dinner recipes for kids that are healthy and convenient are hard to come by! This is a deliciously easy fish cake recipe embraces the convenience of canned salmon and beans. Your whole family will be crazy about this one. Teriyaki Chicken - Nothing beats simple chicken recipes! Here's a easy dinner recipe idea that's an incredibly flavourful and healthy meal your whole family will absolutely love. Teriyaki Sauce Recipe - Learn how to make teriyaki sauce with an incredibly fast and easy marinade recipe that will tranform your meal from bland to grand. 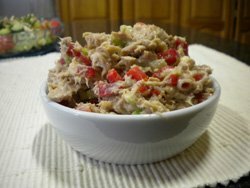 Tuna Salad - How to make tuna salad quickly, easily, and healthly! Warren's Beef Burgers - enjoy this guilt-free all time family favourite for tasty burger recipes that has been given a healthy spin as one of the best ground beef recipes. I love all of these quick dinner recipes and the knowledge that I’m giving my family something incredibly nutritious and delicious that I can whip together so quickly is wonderfully satisfying. I do hope you enjoy trying these easy fast dinner recipes and that they give you great satisfaction too. Why not become part of the Healthy Eating Website! All you do is share your easy fast dinner recipes or any other favourite recipe right here! Your recipe becomes a whole page on this site and part of the healthy eating blog (which shows the site's most recent pages). So become a permanent part of Healthy-Family-Eating.com so others can read, learn and grow from your input!